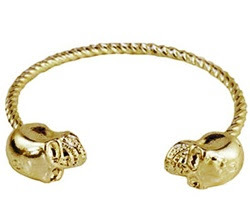 This Alexander McQueen crystal double skull bracelet retails for $330 at Net-A-Porter. See it on Sterling Style (bottom photo) HERE. Sarah Aghili has a similar bracelet - minus the eye crystals in the skull (also available in silver) for only $8.50, giving you a great look for a fraction of the price. Click HERE to view or purchase. genius ! thanks for the tip.